The Global Hackathon Series was initially started by a small community of technologists with one goal in mind: to develop opportunity wherever possible. What started as a way for creators to connect and move their ideas forward turned into a global revolution. Soon, innovators from around the world were joining forces to elevate themselves and their platform - all of which was done through Hackathons. And while we’ve seen lots of changes since the early Hackathon days, one thing has remained the same - innovators are continuing to rise. Innovators rise to meet opportunity, they rise from failure, they rise from all corners of the globe, and they lend a hand to help others rise with them. It’s why the Global Hackathon Series is still going strong to this day, because Hackathons and the opportunities they create allow people to rise, together. We offer our own Grand Prize AND team up with awesome sponsors who have their own challenges and prizes you can go after. Aiming for the HACKcelerator invite? Only in it for some cool hardware? Good news, you can go for as many challenges as you want! 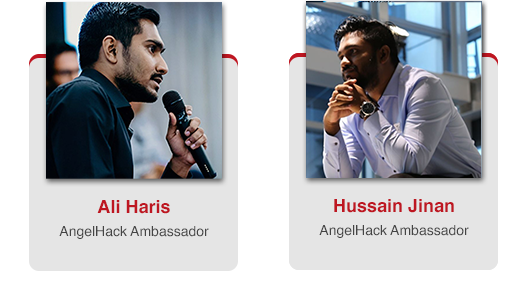 AngelHack Challenge: Challenge yourself and your entrepreneurial spirit. Make something innovative without limits, something that brings positive change to the world, even something that solves a small problem. It’s that simple. AngelHack Prize: The winning team from each hackathon will receive $500 and an invite into AngelHack’s HACKcelerator program. Challenge: Using AWS Amplify: Build a mobile or web application that connects to at least one AWS service provided by the Amplify framework. Additional sponsor challenges and prizes to be announced! One principle that has guided this community since its first Hackathon is that everyone is welcome. Great ideas stem from discussion, and we believe the best discussions start by talking to someone whose background or experiences might differ from your own. With this in mind, we invite all startups, developers, entrepreneurs, and designers who are passionate about creating to join regardless of experience level, geographic location, or similar factors. And if you're under 18 we ask that you bring along a parent or guardian when you check-in so they can sign a participation waiver. 4:00 PM : Winners are Announced / Prizes! Fresh Code – We all start coding at the same time. It’s cool to work on designs beforehand, digital mockups, open source frameworks, and anything else available to everyone, but keep things within fair limits. Code Review – Winning teams may be subject to a code-review at some point following the event or immediately before winning. This is to ensure that all code used is in fact fresh. Ownership and IP – You own your IP and whatever you create. Simple as that. Team Size – No more than five people. Submissions – Each hackathon has its individual hackathon.iopage where projects need to be submitted by the designated time. You’ll receive an email with instructions on how to do just that. Demos – You’ll have 2 minutes to demo the functionality of your project and talk through your idea, and 1 minute for Q&A from judges. Be courteous and cool to your fellow hackers! Check out our Code of Conduct. Want your organization to be involved in a global technology and innovation movement seeking to spread opportunity across the world? A limited set of sponsorships are still available. For more information, please reach out to info@angelhack.com. To see the full rules and eligibility criteria, please check out the Participation Agreement.